The fixed costs stock exchanges impose on the securities industry and investors, often lumped under the general label “market data”, have long been contentious and now are drawing increased scrutiny from regulators. In recent months, the SEC has rejected two fee changes for consolidated data that is sold jointly by the exchanges, and it has announced it will host a roundtable discussion on access to markets and market data at the end of October. On September 19, Commissioner Robert Jackson gave a major address forcefully calling on the SEC to fundamentally reevaluate its approach to oversight of for-profit exchange structure and practices in general. In response, the large exchange operators have gone into full wagon-circling mode. NYSE funded a study that found, unsurprisingly, that the market for data is competitive and costs are fully justified, and Nasdaq issued a press release entitled “Promoting Transparency” in market data, which failed to disclose anything new. One especially glaring omission in these defensive efforts is the failure to mention the cost of exchange “connectivity” fees. Market data and connectivity both concern the power of exchanges to bleed the industry through a rising set of fixed fees. Coincidentally, and more likely not, as exchanges have come under increased fire for their market data fees, they have ramped up the fees they charge for connectivity. Here, too, the SEC seems to be paying attention — in just the last few days, it has suspended connectivity fee hikes by three options exchanges. To be clear, as a securities firm, you have to pay for connectivity to each market other than IEX before you can do anything on the exchange. You can’t receive market data, send orders, get trade confirmations, nothing, unless you are first hooked up to an exchange’s systems. Every other exchange also charges separately for the right to trade (so-called “logical connectivity” fees) based on the number of trading “sessions” each firm requires. Every other exchange charges separately for the market data that is consumed, and those charges increase depending on how the data is used. Apart from all that, you still have to pay transaction fees, unless you can get rebates, another controversial exchange practice. In the context of this complicated network of exchange price structures, connectivity charges represent an entry ticket needed literally to get in the front door. Being “connected” means physical connections in the three major exchange data centers in New Jersey. Exchanges argue that traders can choose to connect to them through a third-party, located miles from their trading systems. No doubt they can, in the same way a tenor can choose to sing opera on the street outside the Met and wait for a crowd to gather and throw coins in a bucket. Certainly, there are firms with more limited business needs that can connect off-site, but as a rule, electronic traders and brokers working for big institutions compete in a world where success is gained or lost in millionths of a second. They need to be present in the room where it happens, to quote the musical Hamilton. Everyone who knows the business knows this to be true. What does it cost? Each exchange offers various options, but for comparison, let’s look at what a fairly standard 10Gb fiber option (of the same type offered by IEX for free) costs on each market. Firms seeking basic connectivity typically require two connections for risk management, which allows the use of the second connection as a backup. You will pay NYSE $20,000 for installation and $264,000 per year in annual fees for the pair of connections (that’s for the cheaper IP option, you would pay more for access through its LCN network). Nasdaq won’t charge nearly as much to install, but you will still face yearly fees of $240,000. Cboe is a relative bargain at $180,000 per year. And for each of these you will pay still more if you do enough volume that you need to connect to an exchange’s disaster recovery facility. Further, the largest firms may need to purchase more connections at each data center to meet individual business needs, requiring a seven-figure payment before executing a single trade. This appears to be a major source of revenue, considering the many hundreds of physical connections the industry requires at the exchange data centers. The exchange operators often seek to justify connectivity fee hikes based on their costs of providing service and maintaining or upgrading the centers, but this seems a bit hard to credit. A couple of years ago, I toured the data center where IEX’s trading systems are located, in Weehawken. The building, by design, is nondescript, inside and out. There is some security presence of course, along with plenty of cameras, and there was a guy in the lobby — I think his name was Derek, he seemed like a smart, professional young person — who made sure my guide and I were cleared for entry. Once you get past Derek, you encounter what seem to be miles of racks and servers and hardware, but an almost eerie absence of people. This makes some sense given that in most circumstances, there is not much need for hands-on management at these sites. Because personnel is the highest cost factor for most businesses, the exchange fees for connectivity intuitively seem excessive but, not wanting to rely on intuition, IEX undertook a rigorous review of our own costs of providing connectivity. We examined all the costs of maintaining space in our primary data centers (we have a presence in two, one where our members connect, the other where our exchange servers reside). 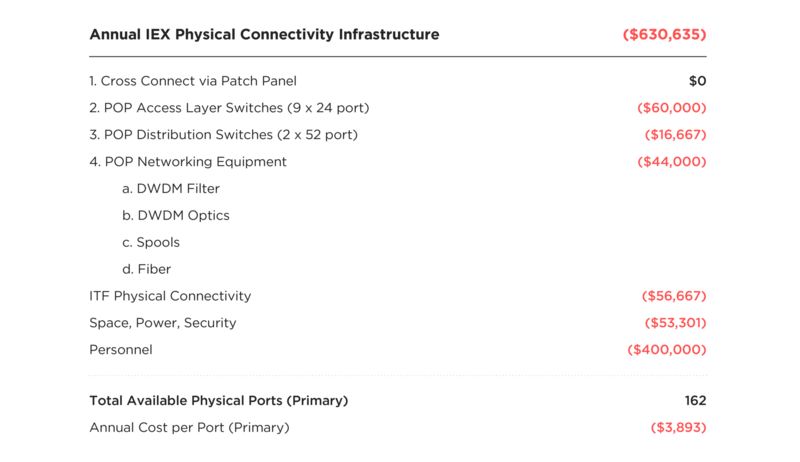 We looked at the cost of equipment, including switches and networking equipment, and related costs in our testing facility. We amortized the cost of physical assets over three years. We allocated full personnel costs, including salary, benefits, and workspace, to people responsible for installation and maintenance of the equipment, and of course we accounted for general data center costs, including space, power, and security (and Derek). One way of looking at these numbers is that if IEX were charging at NYSE or Nasdaq levels ($240,000 — $264,000 in annual fees for two connections), we would more than recoup our annual cost of providing connectivity with the first three users, not including revenue from installation fees. To look at it another way, fees at that level would represent a potential mark-up of more than 3,000% of cost. The other exchange operators may object that their own costs are higher. I have not been extended an invitation to tour their data centers — go figure — but I have it on good authority that they do not differ markedly in design and operational resource needs from the ones IEX uses. One point that ought to be clear is that costs are not correlated with the number of users, because of the way that adding capacity in a data center scales. For example, for the cost of adding a single switch with multiple ports, the per port costs would decrease, not increase. So, to explain the disparity between IEX costs and fees charged by the major operators, you would need to consider factors other than number of users, but it is not clear what factors would explain such dramatic differences. How many Dereks could they possibly need? There is an obvious answer. Exchanges charge at these levels because they can, and they can because the firms responsible for the bulk of trading in the stock market need to be directly hooked up to each major exchange. That is the essence of what economists call “rent seeking”, in this case with the aid of an exclusive government license. Exchanges are entitled to charge for the products and services they offer, and to profit from them if they can innovate in an open, competitive marketplace of products and services. But it is fair to consider the cost of producing products and services in judging whether a market is in fact open and competitive. The connectivity example is not the only evidence of exchange price abuses, but it strongly validates the chorus of complaints by brokers, traders, and investors that they are being unfairly squeezed. With signs that the SEC is listening to them, they now have reason to hope that action will follow. These costs are approximate and provided for informational purposes only. IEX does not make any guarantees, representations or warranties as to, and shall have no liability for, the timeliness, truthfulness, sequence, quality, completeness, accuracy, validity of these figures.